Are you embarrassed by what people would think if they saw your unsightly nails or warts? Would you like a simple easy way to get rid of fungus or warts? Beaver Valley Foot Clinic uses the latest technology, and we are right in your backyard! For Treatment of Fungal Nails Pittsburgh, Onychomycosis, chronic pain, plantar warts. However, the fungus will die, and the results of this procedure will become more apparent when the new nail grows out. In many cases, people only need to get one treatment before they get the results they want. Some people have to return to Beaver Valley Foot Clinic for a follow-up treatment in order to ensure the fungus is gone. What is the Laser Toenail Fungus Procedure? We use the most effective laser for toenail fungus. This laser effectively treats chronic toenail fungus infection. The laser shines a focused light beam to the target area, into the infected toenail. The laser penetrates the toenail and vaporizes the nail plate, where the infection lies, pulling the infection up and removing it. 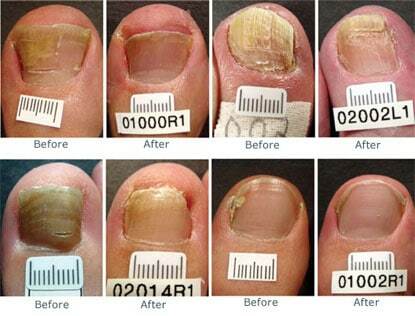 The toenail will grow back within a few months, fungus free. During your initial consultation, our experts will go over the treatment and procedure to eliminate the fungus. Usually one treatment is enough, but sometimes that depends on the individual and the condition of your toenails, which will be determined by your podiatrist. We offer one free follow up treatment for all our patients, just in case. Is the Procedure Painful? How Long Does the Procedure Take? This procedure takes less than 15 minutes and is completely painless, with no drugs or anesthesia required. During the procedure, the fungus appears to be killed by the laser light without harming the rest of your toenail. Some individuals may have a predisposition to the disease, however, or they have an aggressive case that may require periodic treatment to kill any new fungal infection that may arise. What Does FDA Cleared Mean? Our laser has been cleared for dermatological use by the FDA. This is considered a dermatological procedure. The cost of the Procedure may vary by case. Please call our office for pricing. Why Isn’t This Covered By My Insurance? This is considered a cosmetic, not a medical procedure. It causes clear nail growth through the death of the fungus. Very few health insurance plans cover this procedure. How Do I Pay For This Procedure? The Doctors currently offer this procedure on a “fee for service” basis only. You will have to pay for the procedure at the time of your treatment. Cash, checks, money orders, Visa and Mastercard are accepted. We recommend an appointment with Dr. Teimouri, DPM prior to treatment to verify the fungus and the benefits of the procedure to you. She can answer all your medical questions and can be reached at 878-313-3338 with 4 locations. You may also schedule the procedure at Body Beautiful Laser Medi-Spa 12 convenient locations in the Pittsburgh area by calling 724-987-3221. Go to www.BBLMSpa.com to see other available laser procedures.